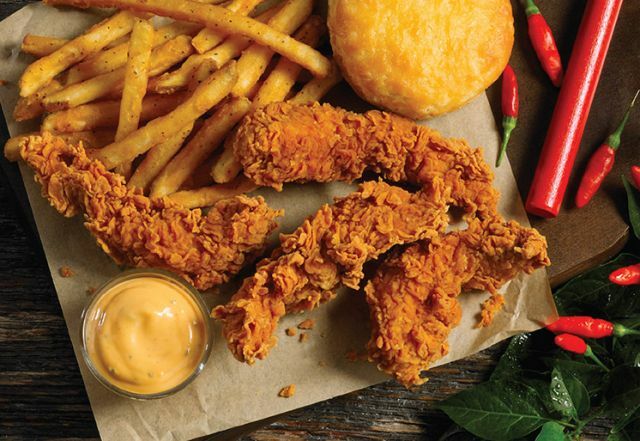 Red Stick Chicken is back at participating Popeyes restaurants for a limited time. A Tabasco and cayenne-marinated version of their regular crispy chicken tenders, the menu item's name refers to the red stick that the farmers at the McIlhenny Company, the makers of Tabasco sauce, use to determine when a pepper is perfectly ripe (if the color of the stick and peppers match, the pepper is ready to be picked). During the promotion you can get four strips of Red Stick Chicken, a side, and a biscuit for $5. They were first introduced back in 2015. The fried chicken chain is also running a limited-time deal where you can get nine pieces of fried chicken (mixed or tenders) for $8.99 (may vary) at participating locations.